Walk East - Why Walk East? Walking can help bring a group together. It’s safe and accessible to a diverse community, and it doesn’t require great physical fitness or equipment. A Walk East walk is a shared, social experience and we’re keen for you to catch up with friends, family and colleagues, and meet new people too, as you stroll along. Enrich its social time together – enjoy spending time with others in your community and workplace, take the chance to meet new people, with plenty of mingling and chatting as you walk. Bring the community together – walking is more flexible than most other physical activities, suitable for almost anywhere, any time, any place. Provide access to all – walking is a cost-effective and safe way to involve all members of your group, and routes are designed to be realistic for mixed-ability groups. We can shape a walk-based programme that will meet the specific interests of your community group, work colleagues or patient groups. 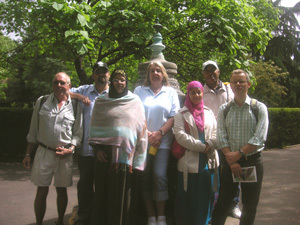 We’ll ensure that people want to join in, they feel welcome, and they enjoy the social aspects of the walk. Why not get in touch, to see how we can work together. "The giraffe and the elephant went for a walk, They stopped in some shade and started to talk"